Decorated holiday trees will be displayed in the Boardwalk Hall lobby from December 5 through the holiday season. 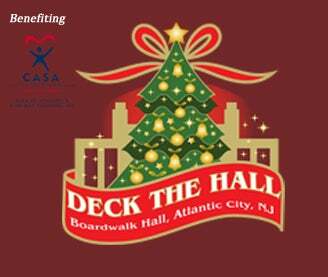 In conjunction and with the support of the Press of Atlantic City and Coca-Cola, local businesses, organizations, arena partners, and individuals are invited to “Deck The Hall” by sponsoring a custom-decorated holiday tree which will be displayed at a private reception with individuals and agencies who help local children and families in the Boardwalk Hall lobby on Thursday, December 7, from 5:30 p.m. to 8:30 p.m. and to the public for the remainder of the holiday season. Proceeds from the event will be donated directly to CASA to help recruit and train more volunteers to serve children living in the foster care system in Atlantic and Cape May counties. In Atlantic and Cape May Counties last fiscal year, 625 children had a CASA volunteer, a trusted adult who will stick with them until their case is resolved. Over 30% of children living in foster care spend more than two years in care and nearly 400 children are still waiting for a volunteer. To date, the annual ‘Deck the Hall- Festival of Trees’ event has generated over $26,000 for local community organizations. The event has generated $20,000 total for CASA over the last two years and in 2014 over $6,000 was raised for the Community FoodBank of New Jersey Southern Branch to support those in need.